Il Sorpasso (1962) starts off, appropriately enough for a road movie, with one its main characters driving through the city streets of Rome to brassy be-bop jazz blasting away on the soundtrack. It sets a fun, energetic pace right from the get-go. Often regarded as his masterpiece, the film was an international hit for director Dino Risi who was part of a celebrated period of Italian cinema during the 1960s and 1970s that took a look at the contradictions of society while still making crowd-pleasing entertainment. On his way to visit a friend, Bruno Cortona (Gassman) stops outside of Roberto Mariani’s (Trintignant) apartment and asks if he can use his phone. The shy man hesitates at first, but allows the charismatic man to come up and into his home. Bruno proceeds to make himself comfortable and talk up a storm much to Roberto’s bemused curiosity. As thanks, Bruno takes Roberts out for a drink, which turns into a meal despite the latter’s insistence that he must go home and study for he’s a law student. Bruno, on the other hand, is a carefree bachelor going through life enjoying it one day at a time. The meal quickly becomes an impromptu road trip from Rome to Tuscany with Bruno and Roberto encountering all sorts of colorful characters and situations. Bruno likes to drive fast and talk loud, especially at passers-by, much to the chagrin of Roberto. Bruno is one of those guys that has an opinion about everything and isn’t afraid to voice it. Roberto, in comparison, is much more reserved. Where Bruno is impulsive and spontaneous, Roberto is cautious, but they begin to feed off each other and much of the joy in watching Il Sorpasso is seeing these contrasting personalities bounce off each other. Both actors inhabit their respective characters fully, working hard to get past their initial stereotypes to shed some light on what motivates them. Vittorio Gassman nails Bruno’s extroverted ladies’ man, but also shows how much Roberto’s affected him during the course of their trip. 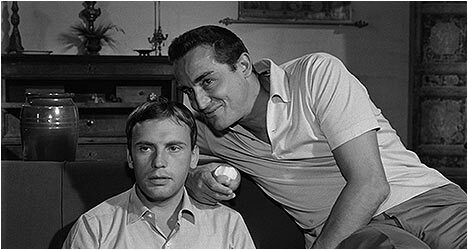 Jean-Louis Trintignant has the more thankless role of the straight-man, but over the course of Il Sorpasso shows Roberto gradually coming out of his shell. Ultimately, Il Sorpasso is a vibrant celebration of life in Italy as Dino Risi takes us through a deserted city into a bustling countryside bursting at the seams with life. The film isn’t all laughs and has its poignant moments, which flesh out its protagonists in wonderful and unexpected ways. The Blu-Ray transfer looks fantastic with a nice amount of detail and the filmic look of Il Sorpasso preserved. There is an introduction by filmmaker Alexander Payne who talks about why he likes Il Sorpasso so much and how it influenced his own road movie Sideways (2004). There is a 20-minute interview with Dino Risi who recounts some of the influences on his film. It came out of two trips he made, one with a fellow filmmaker and the other with a producer friend, which turned out to be adventures that provided plenty of anecdotal material for Il Sorpasso. There is an interview with actor Jean-Louis Trintignant for French television where he talks about how he was cast in the film after principal photography had already started and also shooting the final scene. “Back to Castiglioncello” is a ten-minute excerpt from the 2012 film L’estate di Bruno Cortona: Castiglioncello nell’anno del Sorpasso, which revisits the beach town where much of the second part of Il Sorpasso takes place. Key cast and crew members recount filming anecdotes. There is an interview with screenwriter turned director Ettore Scola. He talks about Italian comedies in the ‘60s and the creation of the character of Bruno. He actually started off as an illustrator for newspapers and moved into film. Film scholar Remi Fournier Lanzoni talks about Il Sorpasso’s enduring legacy, the social commentary contained in it and how it typifies Risi’s directorial style. He also accounts for the rise Italian comedy out of the ashes of World War II with audiences needing light entertainment after enduring such hardships. “A Beautiful Vacation” is a 2006 documentary about Risi who talks about his career. Included are interviews with collaborators, family and friends that speak highly of him. Finally, there is “Speaking with Gassman,” which are excerpts from a documentary about the three-decade working relationship between Risi and the actor who made 16 films together. Gassman started off in theater and eventually made films, but it was his work with Risi that really launched his career.